Fondue doesn't have a particularly exotic origin. It began as a way for Swiss Alp farmers to use up bits of cheese. These were melted in a pot with wine and flour. They then dipped in chunks of stale bread to moisten them and voilà, a feast. But the communal notion of the dish, the sharing of food and the gentle chatter and laughter that ensues when friends precariously balance a morsel of food over a seething lava of melted cheese, lives on. No wonder it was such a hit at 1970s dinner parties with the bright orange fondue pot taking pride of place in the laminex kitchen. 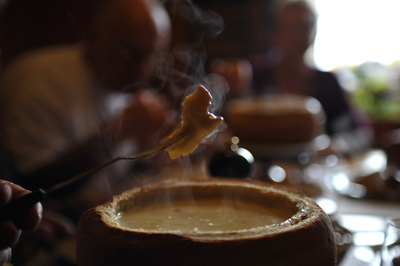 But the tradition is not lost and modern fondue is made from the finest ingredients. And perhaps the addition of kirsch helps matters as well. Here are five very different culinary takes on the humble fondue served in our Melbourne restaurants. For traditional fondue climb the stairs to the Swiss Club in Flinders Lane. This club founded in 1899 is the cultural heart for the Swiss in Melbourne. The fondue is divine and creamy like béchamel sauce. The chef rubs a traditional caquelon (a heavy ceramic pot with a thick short handle) with finely grated garlic before adding white wine. As the wine simmers he adds the imported emmental and gruyere cheeses mixes in the cornflour and then dissolved in the kirsch whilst continuously stirring. The mix is then kept warm at your table with a spirit lamp and the dipping fun begins. Lose your bread in the molten cheese and you owe the table the next bottle of Gewurztraminer. Richmond Hill Café and Larder in Bridge Road Richmond is renowned for its cheeses. They have their own fromagerie (cheese room with controlled temperature and humidity) with great round wheel of cheese maturing. They also famously do matched wine and cheese nights. They also occasionally do fondue nights the next one is on 2 August (further details forthcoming still in the planning stages). But thankfully you can go in any day and order their Swiss cheese gougeres. This is a delectable little modern twist on the classic fondue. They bring you a little bowl with pommery mustard and fondue sauce with a sprinkling of parsley, and then these delectable little cheese puffs. These look golden and solid but when you bite into them they cave into cheesiness which you then dip into the tantalising pot of fondue. Swiss cheese gougeres -$17.50 serves two. Giraffe Cafe is a cosy, funky cafe in Londsdale street with lots of repeat customers returning for the innovative food and the cute decorations of indoor trees and toy giraffes. You feel like you are on safari—so bring a camera. You can order a basic cheese or chocolate fondue but then jazz these up with all kinds of titbits. We ordered mushrooms and toasted bread to dip into our cheese fondue. For our chocolate one- what's a little gluttony between friends- we had cubes of banana, cheesecake and ice-cream balls. Basic fondue is $8. Then $3 a pop for extras. 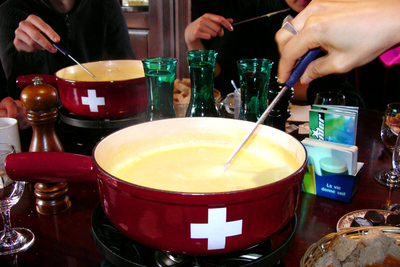 Fondue because of the preparation is only served at night from 5pm onwards. With the rise of dedicated chocolatiers in Melbourne has come a virtual flood of chocolate fondues. The best known is probably Max Brenner but that bald man has been around for awhile now. Although if you haven't visited a store the experience is not to be missed. 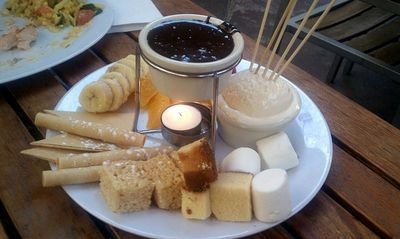 For Belgian chocolate fondue try Chokolait in Little Collins Street where the fondue comes with fresh strawberries, banana and marshmallows(for two $13). But for something even more decadent visit the San Churro chain. Their dreamy, moulton mix comes with mini churros, choc brownies, marshmallows and seasonal fruits. This one is a lot of fun for kids. Why should vegans miss out on the experience of fondue. Coco Loco is a crazy little venue for those who desire their chocolate vegan and gluten free. Stunning concept, amazing interior reminiscent of a brooding cocktail bar from the 1920s. Around the room are photos of the owner's grandfather a dancer in the late 1920's and founder of Coco Loco.You can guarantee everything here is fair-trade and ethically sound. One of the secret ingredients is owner, Khaled Sherbini's special cashew nut milk and his family's chocolate recipes from Africa and Europe. Coco Loco has two kinds of fondue. Ménage Mélange of dairy cheese which contains Coco Loco Kashew Mylk cheese served with sautéd vegetables and spelt or gluten free buckwheat bread. (Recommended with with vin rouge, blanc or sparkling). Then there is Chocolat Noir au chocolat made with Kashew Mylk and served with fruit or if you are fructose intolerant, spelt or gluten free buckwheat bread. Both fondues require 24 hours notice for preparation. Minimum 2 people - priced at $30 per head. If you know of any other great fondues around Melbourne the rest of us would love to know. Also see my recipe for chocolate fondue to make with the family at home. Why? Because sharing fondue with friends is fun. Cost: From about $11 to $30. There's also the Sonley Stonegrill & Bar in Blackburn. They do a wicked fondue dessert. Absolutely topped of the night & a wonderful meal. I tried Coco Loco (now called Sherbini Supper Club) on the weekend. The food, service, and decor were all fabulous and made for a special outing. What a unique subject to write about! Only tried it a few times, in London. Will endeavour to check your suggestions out.